After failing to win comprehensive immigration reform, immigration proponents are now hoping to use the lame-duck session to snag an 11th-hour consolation prize: the DREAM Act. After failing to win comprehensive immigration reform during a period when Democrats controlled both the White House and Congress, immigration proponents are now hoping to use the lame-duck session to snag an 11th-hour consolation prize: the DREAM Act. On Tuesday, President Obama pledged to personally lobby resistant members of Congress to support the bill. But even though the DREAM Act has drawn Republican support in the past, it's unclear whether the White House can win over enough Senate Republicans to make up for the handful of Democrats who are expected to vote against the bill. The DREAM Act has been discussed for almost a decade. The current version would provide "conditional" green cards to as many as 2.1 million people who were brought to the United States illegally by their parents when they were under the age of 16. It would allow them to work, attend college and serve in the military. It also would put them on a path to citizenship. The House is likely to pass the DREAM Act if Speaker Nancy Pelosi, D-Calif., brings it to the floor for a vote. "No decision has been made," Pelosi spokesman Carlos Sanchez said Wednesday. But other sources close to the leadership said the only decision left to be made is what day the vote will occur. The situation in the Senate, however, remains an uphill battle because 60 votes will be needed to block an expected Republican filibuster. Senate Majority Leader Harry Reid, who owes his narrow re-election victory earlier this month in part to Hispanic voters, has pledged to bring up the bill. Proponents don't have the votes now, but they may secure enough to produce a cliffhanger. "I do think there's majority support in the Senate for the DREAM Act," said Lynn Tramonte, deputy director of America's Voice, which is pushing the legislation. "I think we could get over 60 votes if Republicans were part of the equation." Rosemary Jenks of NumbersUSA, a restrictionist group that opposes the bill, said, "As far as we can tell they don't have the votes in the Senate to pass it right now. The thing that bothers me is that it would be very difficult to beat in the House, and if Pelosi were to bring it up first and pass it, I don't know what kind of effect that momentum would have in the Senate." To get 60 votes in the Senate, proponents would need to win more than half of the 20 or so Democratic and Republican lawmakers whose votes are uncertain at this time. (Check below for a list of those whose votes are considered uncertain at this point.) Proponents believe they have 53 Democratic votes and therefore will need at least seven Republicans. Several Senate Republicans who have voted for the DREAM Act in the past are expected to oppose it this time around, including Sens. John McCain of Arizona and Orrin Hatch of Utah. Hatch had been the initial sponsor of the bill back in 2001. The Senate has voted on the DREAM Act before. In 2007, the measure got 52 votes, falling eight short of the number needed to pass. The president met Tuesday with congressional Hispanic leaders, who said afterward that Obama had pledged to lobby Democratic lawmakers who are wavering and Republicans who have supported the legislation in the past. "Passage of the DREAM Act is achievable right now," Rep. Luis Gutierrez, D-Ill., said after the White House meeting. "It is the only piece of immigration reform legislation that can get broad support from Democrats and has attracted significant Republican support in the recent past." Proponents haven't pushed for separate consideration of the DREAM Act in recent years because they feared they would lose their most compelling and attractive argument for comprehensive immigration reform, which would benefit the rest of the estimated 11 million people who are in the country illegally and who are likely to be viewed less sympathetically. 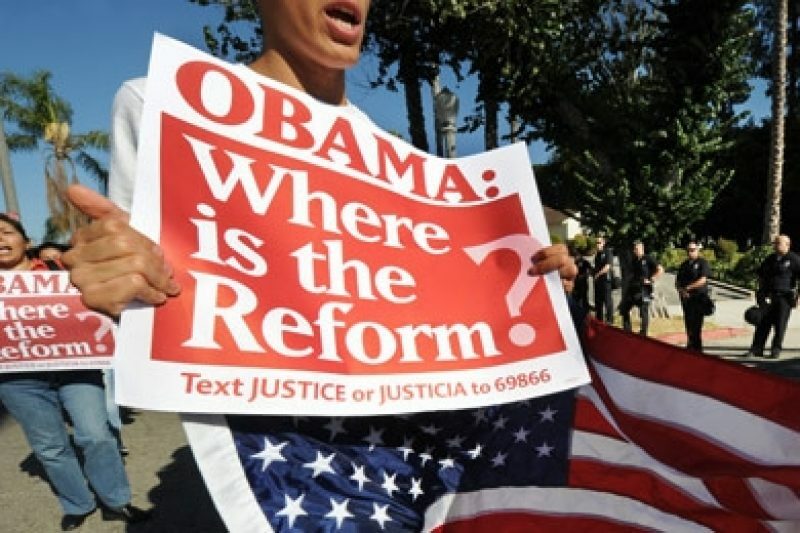 The people the DREAM Act would benefit are seen as the poster boys and girls for reform. Many were brought to the United States as infants, have little or no familiarity with the countries where they were born, have grown up and come of age in the United States and are ready for college, work or military service but can't pursue any of those paths because they aren't legal residents. The act would entitle them to six years of "conditional" legal resident status, in essence a temporary green card that could be converted to a permanent green card after six years if they satisfy certain requirements, including attending college for two years or joining the military. In recent months young activists have pushed aside the political and strategic concerns of their pro-immigration leaders to press for the DREAM Act with or without comprehensive reform. Some held news conferences to disclose their undocumented status, daring immigration authorities to arrest and deport them, which didn't happen. Republican gains in the recent congressional elections have made it clear to pro-immigration leaders that any chance of comprehensive reform is gone for now. So they, too, are belatedly joining the full-court press for passage of the DREAM Act by itself, calling it, as Obama did on Tuesday, a "down payment" on comprehensive immigration reform. Proponents of the legislation say it is a matter of simple fairness to allow people brought to the country illegally by their parents when they were children to assimilate into society's mainstream. They also say it will be better for the country for these young people to be productive participants in the economy rather than stuck on the margins. Opponents call it a backdoor amnesty, saying once the children get full permanent resident status they will be able to apply for green cards for their parents. Also, opponents say the DREAM Act's beneficiaries would be eligible for in-state tuition at colleges and universities in the states where they live, while non-resident U.S. citizen students would be paying much higher out-of-state tuition. And they question how these schools would pay for the expected higher student enrollment. They also question the feasibility and cost of undertaking the legalization program. The exact number of people who might be eligible for conditional green cards under the DREAM Act is unknown, but estimates range from 1 million to 2.1 million. The lame-duck session is likely to be the last chance for passing the DREAM Act anytime soon, as Republicans will take control of the House in January. Until the next round of elections in 2012, immigration proponents are likely to be playing legislative defense rather than offense on Capitol Hill. Next year, the agenda is expected to shift from what it has been under Democrats -- exclusively passing comprehensive immigration reform -- to a drumbeat of critical hearings contending that the Obama administration is being too soft in enforcing immigration laws. The focus will likely be on tightening rather than relaxing immigration policies, including stricter border and workplace enforcement.